I joined WPCS in the fall of 2010. Probably our twelve-hour “Choirstravaganza”: the performance on the local news morning show with the early call time, a noontime concert at Fourth Presbyterian on Michigan Avenue, a lunch outing with the choir, caroling at Cloudgate in Millennium Park, and an awesome end of the year choir party. It was great! Travel, outdoor adventures with my family, and attending any kind of music or dance performance wherever I happen to be. Pretty much any song by Rufus Wainwright, Baroque opera arias of Cecilia Bartoli, and the Bach Goldberg Variations. That’s all. Sigh . . . Britney Spears. 8:30 a.m. on the el on a weekday morning. We can break the silence and (hopefully) bring some joy to all those people dreading their workdays. You can learn more about Jon and other choir members by visiting out Meet the Choir page! 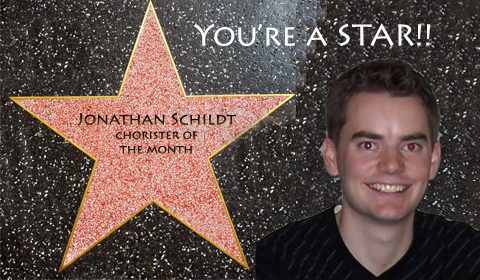 Feel free to congratulate Jon on his leadership and tell him how awesome he is in the comment box below.